Relax with amazing ocean views, day or night! Afternoon view of Molokai. Travel guides, CDs, DVDs, & binoculars – and views! 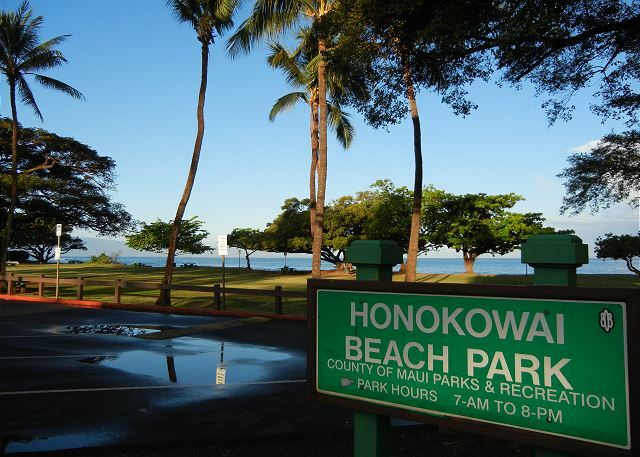 Beautiful and well maintained Honokowai Beach Park. Second level with direct oceanfront views. Free onsite parking for one vehicle. 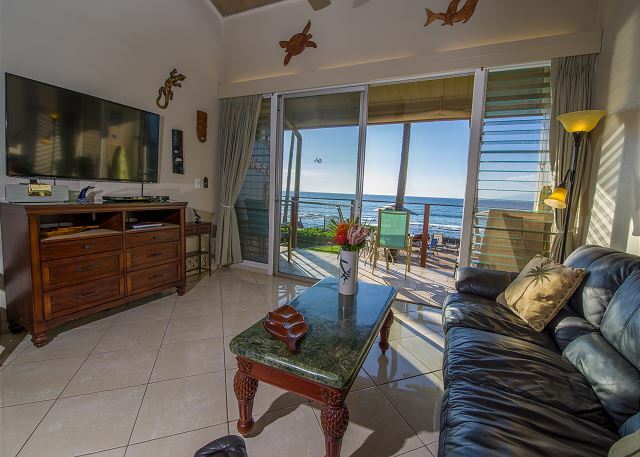 Once you enter our condo, enjoy sweeping ocean views and relax with sounds of the waves, caressing the shore line. 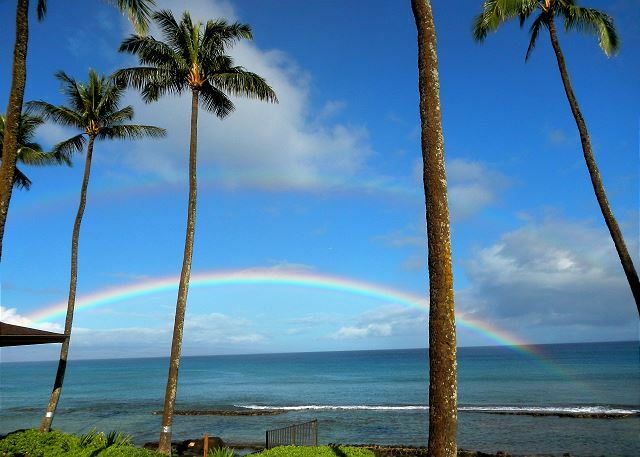 Step onto our lanai, view the islands of Lana'i and Moloka'i with the most amazing scenery Hawaii may offer. 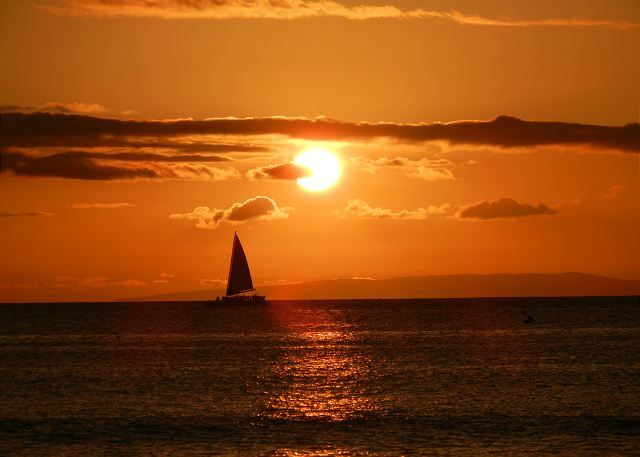 End your day with brilliant sunsets all year round, as this is where romance occurs. 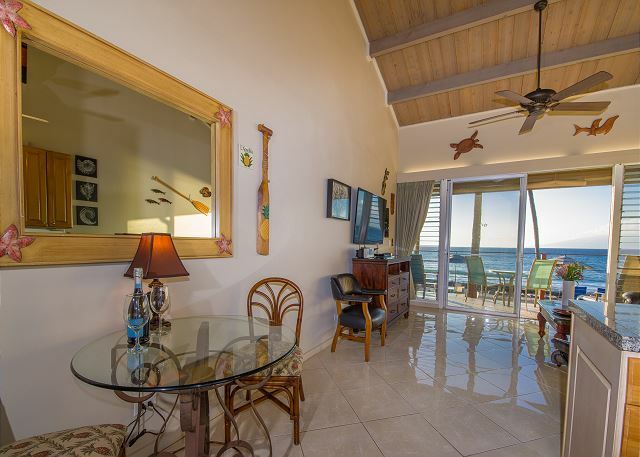 Our condo is located on the 2nd floor with commanding direct oceanfront views that are breathtaking and almost indescribable. The ocean is so close, it may feel like you could walk right in. 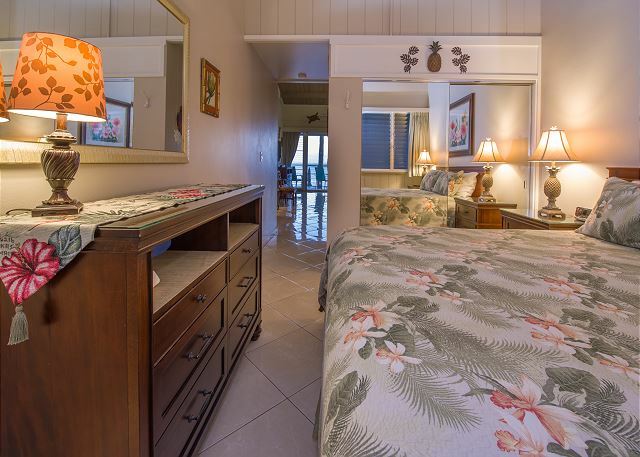 Swim in the oceanfront pool, relax in a chaise lounge while gazing at the ocean and islands, or you may just want to take it all in from your lanai! Snorkel out front along the coral reef, enjoy our oceanfront BBQ's, or watch the large sea turtles (Honu) forage year round. Humpback whale sightings are a regular occurrence during their migration. The beach can be accessed on each side of the property for walking, snorkeling, searching for beach glass and shells, wading in the tide pools, or just enjoying the sun. 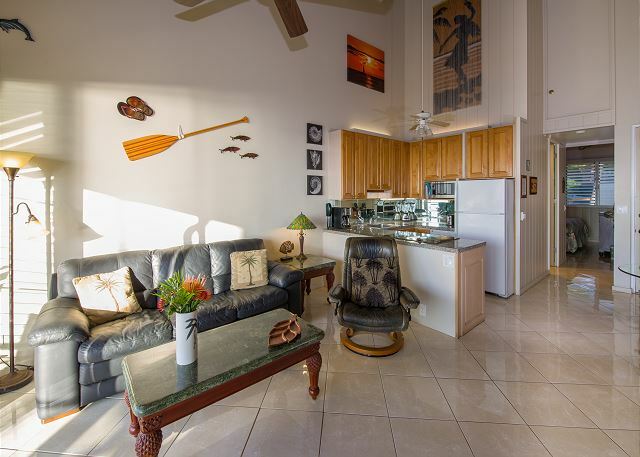 Our fully tiled condo boasts expansive 18’ vaulted redwood ceilings, is tastefully decorated with an island ambiance, and comfortably furnished so that you can relax when not outdoors enjoying the abundance of activities that Maui has to offer. 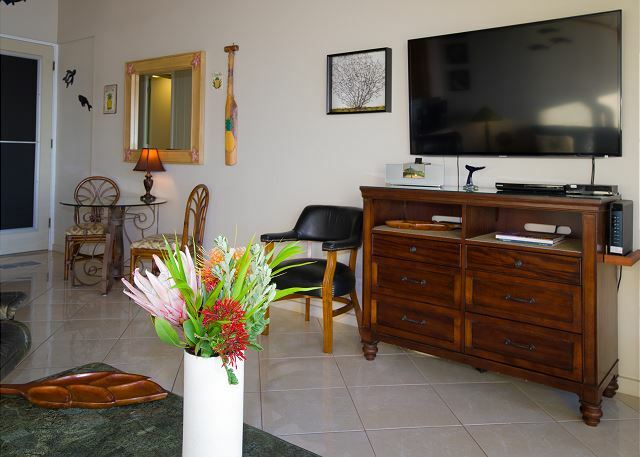 Our condo is not air-conditioned - naturally cooled by West Maui’s trade winds breezing through louvered windows, accompanied by our high-speed ceiling fans. For your entertainment, enjoy our Samsung 55” LCD Flat Screen TV, Blu-Ray disc player, Philips I-phone/I-pod stereo with radio/CD, a selection of CD’s/ DVD's and free wireless internet. Our kitchen includes granite counters, new cooktop/ oven, microwave and refrigerator. A selection of spices for those who may wish to practice their culinary skills. You may wish to take a break from the kitchen, sample the fresh island cuisine with wonderful dining establishments nearby. 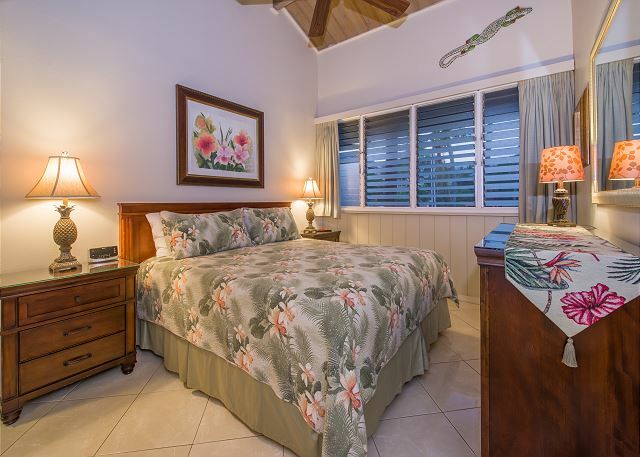 Our bedroom features a Sealy posturepedic Cal-King bed, beautiful furnishings, Hawaiian themed bedding and artwork. This peaceful environment is further enhanced by block-out curtains and the sounds of the ocean lulling you to sleep at night. Bathroom includes a frameless glass shower, granite counter, medicine/ vanity cabinets and Kohler fixtures. 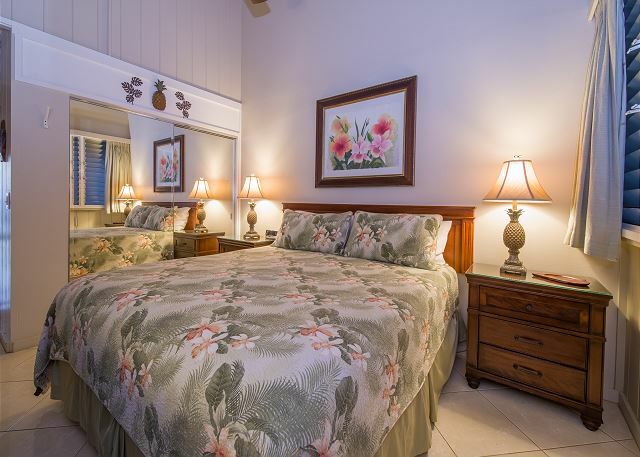 Escape for a romantic, tropical getaway, while enjoying the captivating island culture of Maui, Hale Kai # 216 - Your Pacific Paradise, you have found the right place. 216 was clean & bright , we could tell Owners have pride in unit . Kitchen was great, Bed & bedroom comfy & nice . Living room nice however one wall Airconditioner would put 216 in Orbit! View of pool & Ocean great, Lanai fine, Mgr nice & knowledgeable! We may rent 216 again in future, I would rate it a B + , put air conditioning in a A . Exactly what we were looking for! Beautiful view, nice pool, great beaches and parks. Loved the Farmers market and Bad *** coffee. The management team at Hali Kai had great recommendations for restaurants and other snorkeling beaches and were super nice. All our neighbors were courteous and respectful. We would stay there again and recommend this place and unit 216 as a perfect vacation paradise. We love the Hale Mai! 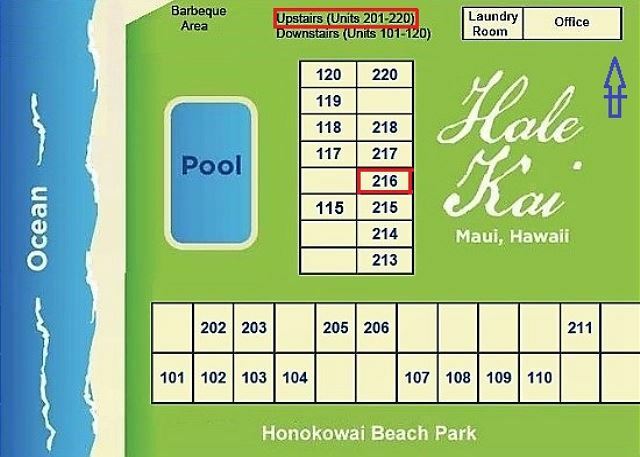 We’ ve been staying in 216@ the Hale Kai for over 6 years. This condo is extremely well maintained and one of the best locations in the complex! The view is spectacular! You can’t beat the HaleKai for location: the Farmers’ Market, Bad *** Coffee, organic grocery are across the street & a block down! Aloha Cyndy, We truly appreciate your positive feedback and continued patronage. Thanks for mentioning the local food spots we also enjoy. Looking forward to hosting you in 2020! Mahalo, The Walls, Hale Kai #216. We loved our stay! We could see whales spouting and sea turtles swimming from the balcony. 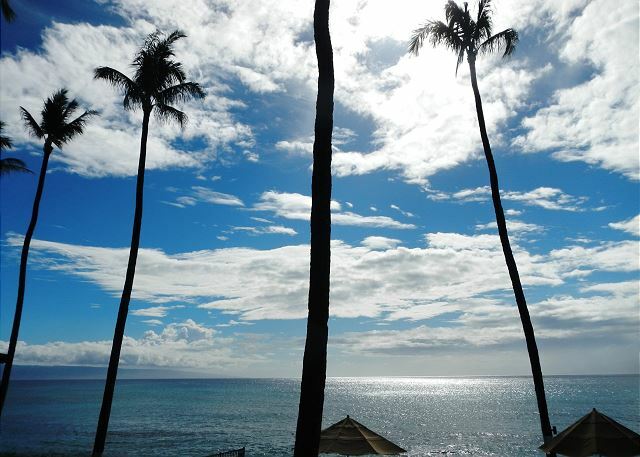 Aloha, Our views are spectacular! Happy you experienced watching Humpback whales and sea turtles from our balcony. 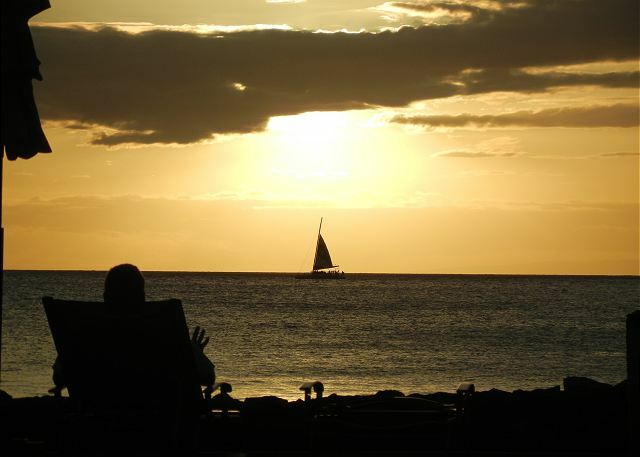 Along with the islands off-shore it's easy to lay in the sun, relax, enjoy the day, sunset or evening on a starry night. Thanks for choosing our condo, we hope to host your next stay. Mahalo, The Walls, Hale Kai #216. Another year and another fabulous vacation in 216. 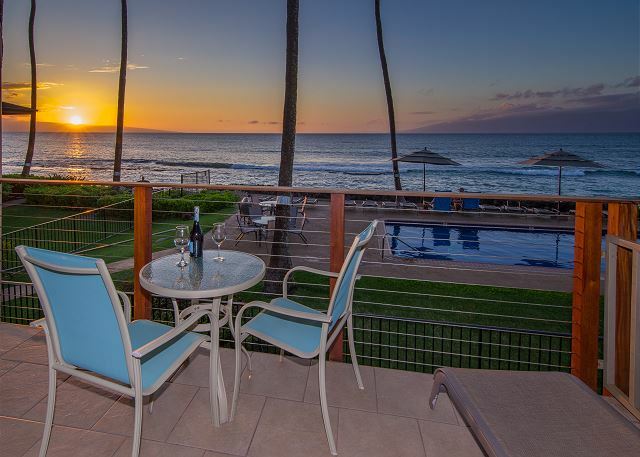 The beautiful ocean view from the lanai to watch the sunset is a treat. Aloha Sandra, Thanks for sharing your positive feedback. 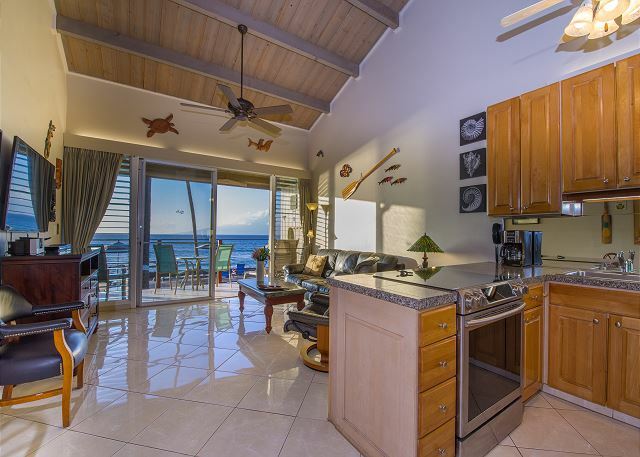 Our direct oceanfront views are spectacular, not only ‘from the lanai’ but also from immediately stepping through the front door, extending into the kitchen, dining area and living room, as shown in our photos. 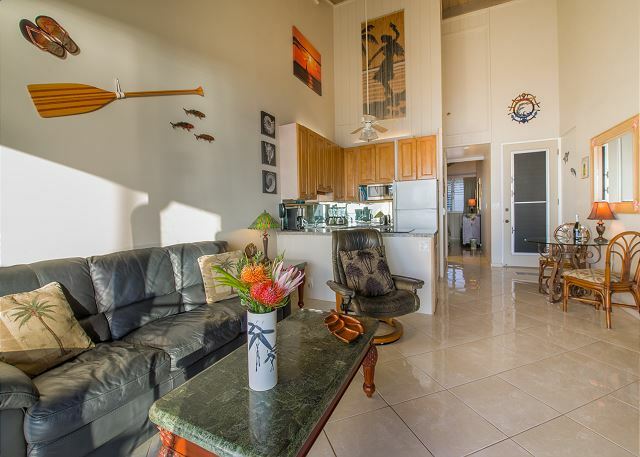 We offer a restful ocean theme of ‘Old Hawaii’ in a Polynesian building with only 40 condos, free parking for one car, free hi-speed secure Wi-Fi and an oceanfront pool. With a beautiful beach park next door, a two-minute walk to shops, including the organic farmers market, restaurants close by and local coffee shop, one may never want to go home! Mahalo, The Walls, Hale Kai #216. We have stayed in unit #216 for the past 3 years and are completely satisfied with our stay there. The location and view are beautiful and the room is always in perfect condition. We have access to a wonderful beach for swimming and sunning as well as enjoying a dip in the onsite pool. The management is always eager to make your stay comfortable. We will be returning to this unit next year for another great vacation. Can't wait. The condo is in a great location. Close to a coffee shop, market, restaurants, and best of all is the beach. The water is perfect with a large reef in front to help calm the waves. Fantastic spot, we can’t wait to go back. The condo was spotless and came with all the essentials needed for our week long holiday. You get instant beach access for snorkeling and the pool is also a great option if you’re looking to mingle with neighbours. My favourite things about the condo was : 1) Waking up to waves and birds, 2) friendly neighbours and staff, 3) being able to stay in when dining out gets tiresome, 4) close proximity to delicious poke and groceries, and 5) we actually saw a turtle basking on the shore on our last evening there. Our experience here was excellent and we would definitely come back again. An amazing location with all desired ameneties. For any snorkler - I would recommend not wasting your time at the more touristy spots and just go down below during low tides. I was able to find a stingray, turtles and more fish you could identify. Definitely intend to visit here specifically again. Super nice, clean and comfortable condo with great ocean view. We had a fantastic time! 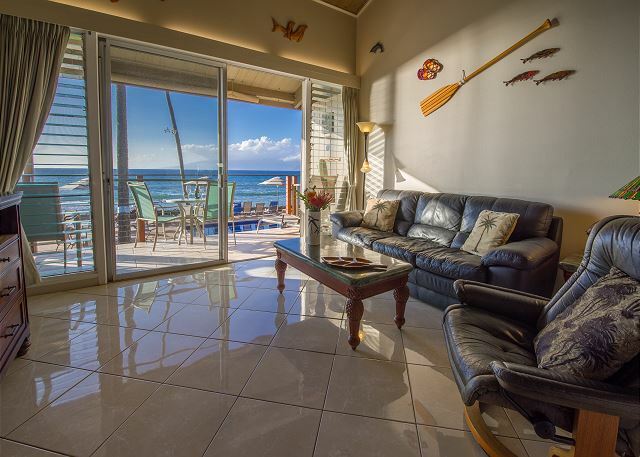 We had such a great time at the Hale Kai Oceanfront Condominiums. They had everything we needed. The pool was my favorite. We could sit under the umbrellas and watch the turtles swimming. This is a great location with a famers market within walking distance. Our stay at Hale Kai was perfect. The location was exceptional. 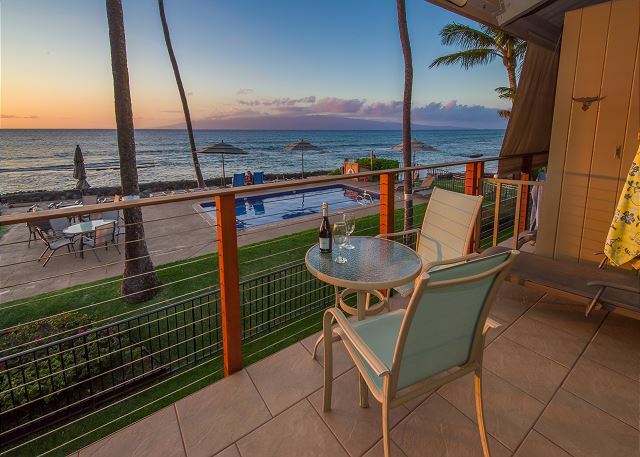 The lanai offered a front row seat to an amazing sunset each night. The small beach was great for sea turtle sightings and we even got to see a beautiful rainbow. The inside fans kept the bedroom a comfortable temperature and the place was very clean. We highly recommend this place to all! Honeymoon with an amazing view! We loved staying here for our honeymoon on Maui. The view from our room was incredible, we loved watching the sun set and falling asleep to the waves every night - incredible. We liked that there weren't that many units here so it was quieter. There were still families with young kids but nothing disruptive and you'll get that anywhere you stay. The unit was clean and comfortable. There is no AC in the unit but between all the ceiling fans and the ocean breeze we didn't really need it. We also loved the location, we walked to the Farmer's Market every day for their acai bowls and local coffee shops (Bad *** Coffee is amazing) and restaurants nearby - The Fish Market was our go-to lunch place. We loved that we could just walk out onto the beach directly. Never over crowded like the larger beaches nearby. Highly recommend and we will definitely stay here again! Everything about the rental was perfect. The view grabs you when you walk in. Very clean and has full kitchen. Anything you’d need. 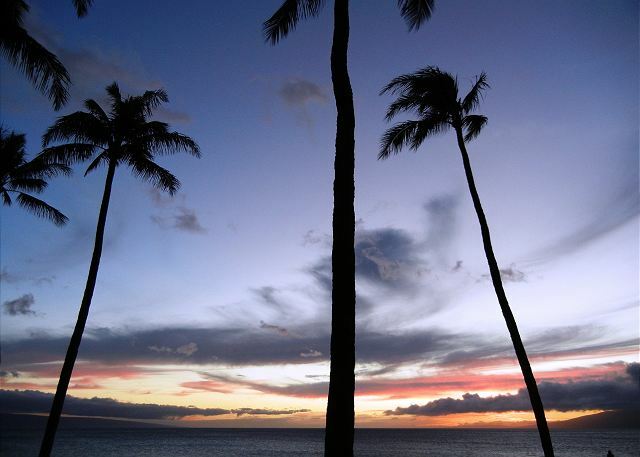 Location is nice too with the farmers market and down the street from Lahaina and Kaanapali. Highly recommend this unit. Perfect for 2 people. Though we didn’t use it, the laundry facilities would have been handy on a longer stay. Overall we were satisfied with our stay. Unit had everything we needed and having the ocean view outside our balcony was beautiful however the bedroom faces the street and there was a lot of noise. We had to close the windows at night because of the noise and because there was no air conditioning in the unit it was very warm in the bedroom despite having a ceiling fan. This made it very difficult to sleep. We had to pick between street noise or a hot room and neither allowed us a good nights sleep. We love the Hale Kai, especially the condo (216) we rent annually! The view can't be improved, the condo is comfortable and well-equiped! We enjoy reconnecting with old friends and meeting new ones. The location is great with Farmers' Market, Bad *** Coffee and other businesses and restaurants within a short walk. We had a wonderful stay at the Hale Kai from beginning to end. The condo had a wonderful view of the ocean, was clean and comfortable. The guests we met around the pool were friendly and very informative, as many of them had stayed there before, some for many years in a row. The rental agent Valerie was super helpful and friendly. We loved the location, across from the wonderful Farmer's Market and walking distance to the ABC Store, asian take-out location and wonderful Maui Fish Market. We love taking a walk every morning up the road, interacting with many other visitors from the area. We enjoyed our stay there so much, we have already booked a second visit for next year! A perfect place to stay and just relax and enjoy the view or to drive to many wonderful tourist areas close by. We will definitely recommend the Hale Kai to our friends and can't wait to return! Our stay at Hale Kai #216 was absolutely wonderful! 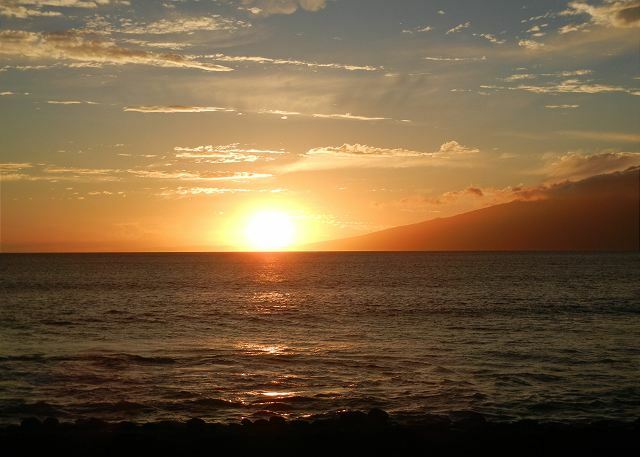 We loved being centrally located on West Maui, the ocean views are unparalleled, and everything was very clean and tidy. Our only issue was that the unit did not have A/C. The ocean breeze helped a great deal and the unit did have ceiling fans. It was just 90+ degrees when we were in Maui so it was a bit uncomfortable. Thank you for a wonderful stay! The condo was just as described and very comfortable. We loved our stay and look forward to returning soon! 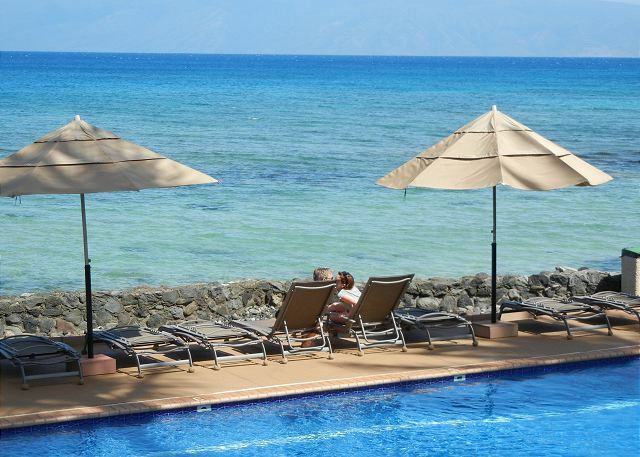 Hale Kai is our favorite place to stay in Maui! Fabulous location! 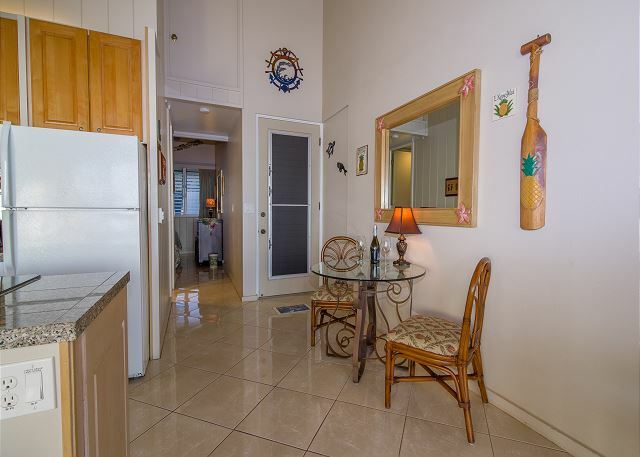 Walking distance from West Maui airport (1.3 mis.) Walking distance to hourly bus service. Right on a pretty selided strip of beach and adjacent to a larger public beach park. Friendly residents and gorgeous sunsets. Valerie makes you feel at home when checking you in. The personal attention was sweet. We absolutely loved this place, and never wanted to leave. Pool and ocean at your fingertips. Nightly sunset over the ocean and we tried to never miss one. Very conveniently located close to shopping, restaurants, groceries, and sight-seeing. The resort was well-maintained and the service was exceptional! We will be back in 2018. Only downside for us were the amount of kids on the resort, but for the most part they were usually well behaved. Other than that, a perfect place to spend our honeymoon. 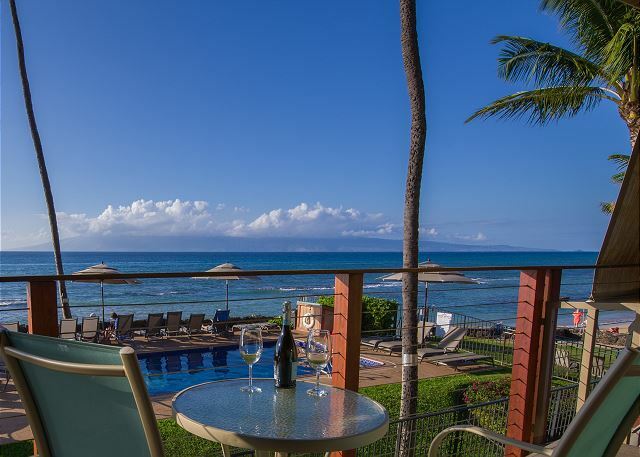 This is the fourth year we've rented #216 at the Hale Kai, Lahaina, Maui. It is like our "home-away-from-home"! We've made lots of friends we see annually. The location is excellent: Farmer's Market, Bad *** Coffee, organic market & Mexican across the street with other great take-outs down another block. The management is excellent, the grounds are well maintained + they have the nicest laundry room I've ever seen! We always sign up for the next year before we leave. The best part of our honeymoon! Room 216 at Hale Kai was incredible. I researched properties for months before deciding on this one and it was the best decision ever! Our favorite part of our honeymoon was coming "home" to this condo and watching our million dollar view. The unit was clean and beautiful, the bed comfortable and kitchen well stocked. This unit is right on the ocean so you wake up to the sound of ocean waves every morning. We agreed we would stay at this property any time we come to Maui. Thanks for making our honeymoon so magical. Great location near stores and eateries, waterfront, convenient. #216 is a clean comfortable suite with great ocean views. We already plan to return next year. The owner Mike was on site in his other unit and is a friendly host who keeps his suites up to date and nicely furnished. Staff on site are friendly and helpful. Enjoyed Dukes restaurant, the Gazebo and other local haunts. Can't wait to return next year. Our 3 week stay in unit 216 was Top Notch. The unit was immaculate and upgraded in every respect. The grounds were well-manicured and the view from our Lanai was spectacular. We looked out on the islands of Molokai and Lanai. The ocean was 30 feet away and we saw Turtles in the surf everyday. Didn't want to come home. The condo is wonderful - most notably the view. The kitchen and bathroom have been nicely upgraded. The kitchen is stocked with the things you need to make a nice meal (including basic spices, etc). Fish Market Maui is very close and has amazing fish - both prepared and ready to cook. Owner provided beach chairs, cooler, and beach towels make it easy to venture out for a nice day at a nearby beach. Try Napili (great happy hour at the hotel bar, calm waters) or Kaanapali (calm waters, great snorkeling w/ rentals at the Sheraton for 1 hr). Within a short drive there are several amazing beaches. The condo is very quiet and being right above the pool was not a disturbance at all. Everyone seemed to be relaxing as much as we were! Overall, the condo was a great value, extremely clean and we would stay there again! 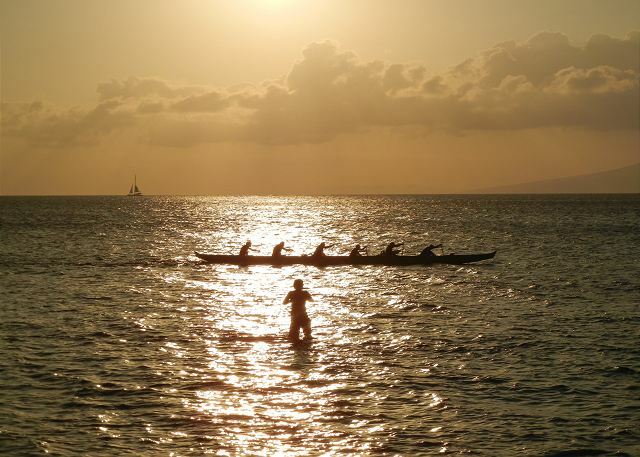 We would also recommend Bike Maui for the Haleakala sunrise bike tour and Paragon catamaran snorkeling tour through Sail Maui...both were very well done and worth the money. We had a great time and loved the unit we were in. We had stayed in a lower unit the last couple of years. My wife and I ran into the owner and had the opportunity to see this condo. We booked in August of 2016 and were very glad we stayed in this condo. It is nicely appointed and the view from on more floor up is amazing. We love Hale Kai with it's privacy, amenities and proximity to attractions without being too close. Perfect location, and perfect condo! The Hale Kai is a wonderful place. It is one of the few places on the west side of Maui that has the pool on the beach side of the complex. Very cool. The owner of #216 has done a great job and the view is incomparable. Clean, spacious and comfortable condo with a stunning view. Absolutely recommendable. Nicely upgraded, great location! We had a very nice time and it is obvious the owners have gone to great lengths to make sure we had everything we needed for fun in the sun. Our unit needs new furniture, otherwise great. this is a very nice small condo. Each unit is indiviually owned so each is decorated differently. We had a very lovely remodeled unit. We enjoyed our stay as it within walking distance to amenities. We could see the whales from our lanai. There is a small beach and a small pool area. The ladies at the office are friendly and are very accommodating. If you are looking for a five star resort this is not the place for you. We most definitely would stay here again. We had a wonderful time. 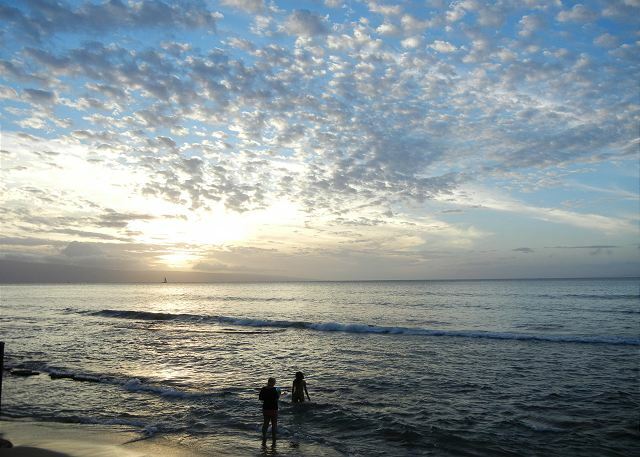 It was our first time in Hawaii and it was beautiful and the place was a good place to come home to at the end of the day. We love the Hale Kai! It's a great location with the Farmer's Market, Bad *** Coffee & organic & Mexican groceries just across the street! Lots of turtles on the reef in front + on the little beach. Unit 216 is well-decorated and maintained. It is a pleasure to stay there! We met lots of friendly people by the pool and went to the Pupu Party our last night. We had a fantastic stay, and the property description was totally accurate. With a small, almost private little beach on one side and a big beach and park on the other, it was just perfect for relaxing and getting in the water. And then the tiled pool was simply beautiful! The owners and manager were great and one of the fellow owners even came by to check on us, and offer help. Besides relaxing on the lanai and at the beach, we did the submarine, the Roberts Heavenly Hana tour and the bike ride down the volcano via Tom Barefoot's tours, all of which we would highly recommend. The location is close to much of the touristy shopping, and good restaurants. We really liked a little hole in the wall just down the road called 'The Fish Market'. Mostly an awesome place to stay. 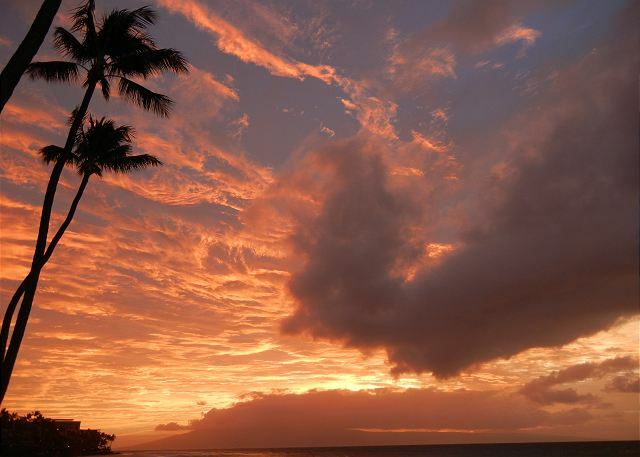 My wife and I enjoyed our stay in Maui and at Hale Kai and is very centrally located for many things. We liked the "laid back" atmosphere at the condo versus the big resorts. We found the condo to be mostly clean, had a little sand between the cushions on the couch (which I did tell Valerie). The ONLY issue we had was the heat and lack of air flow. Ive learned that when we go back to Hawaii, we want a condo with air conditioning. It was hard for both of us to sleep with hot and humid conditions. We did have the louvers open all the time even at night. Unfortunately we encountered a lot of noise at night from people talking to loud, and street traffic. An air conditioned condo would eliminate that. I dont know know if people care or not about air conditioning, but we do. If you had air installed, we would highly consider coming back to the same condo. Great condo! Very comfortable... sofa, chair, bed! Loved the view! This is a wonderful condo with a perfect location. Stayed here for 8 days with my daughter and it couldn't have been a better time. The place is clean, simple and has everything you need for a carefree stay. Our view was amazing, although there is a flat screen tv, we didn't turn it on once. The blender was a plus for morning smoothies on the lanai. :). Breakfast with an ocean view every day. Pool was great, bed was great. Staff helpful. We saw whales in the distance and turtles on our beach. Perfect. No complaints! Only suggestion would be to have a beach towel service so we could trade them in for clean ones. This is a sparkling clean condo right on the water. 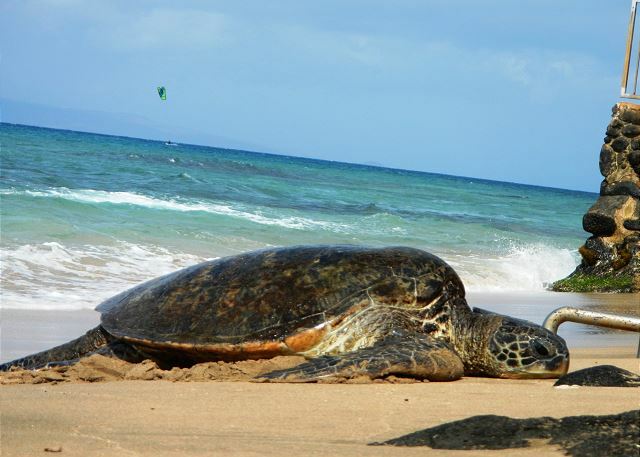 Watch whales every morning (January) from the lanai and see turtles feeding in the water. We ate breakfast in, packed lunches and saw the sights every day. We are a couple in our early 60's and this was our first trip to the islands. We will be back! This is the second year we've enjoyed #216 at the Hale Kai. This year, the condo was even better because the bathroom was totally redone: shower a bit bigger, new vanity & toilet, wonderful new tile. These condos aren't large but who needs 'large' on vacation, besides, we ate every meal out on the lanai. You can't beat the view, except when there's VOG. The Hale Kai is an outstanding location for: coffee, farmers' market, groceries & great take out food. My only complaint is an additional set of towels for a one week stay. We loved our stay at this condo. We arrived after office hours and were able to use the lock box to get inside. Someone even checked in on us later on to make sure we were able to get in and that we had everything we needed. This was a quiet relaxing complex right on the ocean. We were able to see whales and turtles while sitting on the lanai. There is a small private beach that we were able to use to enter the ocean and snorkel. We saw quite the variety of fish! Across the street is a nice coffee shop as well as a parking lot that hosts a farmers market. We also walked to Whalers village shopping mall from the condo. The condo itself was very nice. We loved the tile floors and comfortable furniture. We loved how the tradewinds kept the condo nice and cool and how we would fall asleep to the sound of the ocean. The complex is well cared for and you will see the management out every day cleaning the pool area and bbq. We will definitely be back! It's an unbelievable place to stay with an unbelievable view and unbelievable people that work there and unbelievable residents that make your unbeleivable stay, we'll...UNBELIEVABLE ! Suite 216 is truly a home away from home with great amenities. The suite is clean, well organized and maintained. The view from the lanai is second to none. We look forward to returning in the future. This was a special anniversary trip and we couldn't have been happier. The location was beautiful. Our room looked straight out to the ocean. We saw sea turtles every day. The room had everything we needed. I would maybe recommend some grip wear for the shower so no one can slip. We loved our visit to Maui. I didn't want to come home from our wonderful trip. The conch shell at sunset was a treat. The moon was also full on our visit which made for amazing photos. Condo well maintained. Staff amazing! Great to have parking and free wifi. 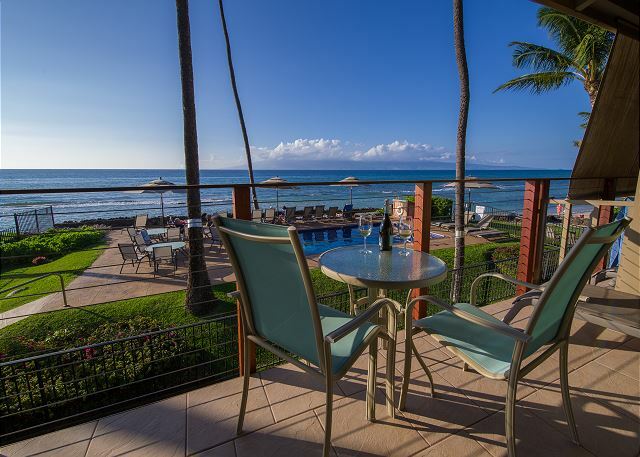 If you're looking for a fabulous condo to stay on your trip to Maui stay at Hale Kai. Great time. Thank you and Mahalo. We will definitely stay with you again. Very nice condo right on the ocean. Lovely pool and great staff. Some traffic but very quiet from about 11PM to 5AM. Can walk to grocery store and a few small restaurants and just a few minute drive to anywhere on the West Shore. Fantastic unit, great location - we loved it! The unit exceeded our expectations. The layout was good and it was furnished to a high standard. Also quality kitchen appliances and lots of little extras provided which were helpful when cooking. We though was one of the best located units in the building. Absolutely recommend this unit and would stay here again. Awesome location, #216 recently upgraded with pleasant furnishings and comfy bed. Great view for whale watching, turtles sunbathed on our beach. Farmers market and shops within 1-2 block walk. Highly recommend and we will be enjoying the condo again soon. We were fortunate that there had been a cancellation for #216 at the Hale Kai. What a wonderful condo and great view! This condo was recently renovated by the owner. It is tastefully decorated, well-outfitted, has a new king size bed and great shower. What more can you ask for! Super location with farmer's market, Bad *** Coffee and many restaurants/take-outs within an easy walk. We highly recommend and are returning next year. A bit windy for good snorkeling but that can't be controled. Enjoyed the stay. Room 216 with no carpets suited us very nicely. Being upstairs with the doors and louvered windows open night and day kept the temps and fresh air just right. The snorkeling just outside in the ocean was convenient and as good as anywhere else we went (lots of turtles). We didn't know what to expect and we were pleasantly surprised with the wonderful condo we had rented! Clean, modern, and very thoughtfully equipped and furnished! Thanks and we'll come again! Everything was absolutely amazing. From the location to the view ! My wife and I had another great time at the Hale Kai! We our already booked for next year and can hardly wait! Once again Valerie in the office was very helpful and she is a great asset to the Hale Kai "family". Loved it! Turtles showing their heads right in front! Beautiful room, complex, and location. Great staff and friendly neighbors. Can't wait to go back! The view was wonderful. Condo #216 was clean throughout and the price is very affordable during this time. We would definitely recommend Hale Kai to family and friends. We had a wonderful visit. The condo was very clean and in a good location. Just one block away is a nice coffee shop and an organic farmers market/grocery store. Plenty of turtles to be seen at high tide right in front of the breakwall. The ceiling fan over the bed would not turn on high, so we asked the property manager to take a look at it for us. It couldn't be fixed right away but Valerie was great and brought us over a tower fan to use in that room. The only draw back was the bedroom is on the parking lot/road side and can be a bit difficult to get to sleep at first. You do get use to it and the fan running on high helps with the air movement and to mask any outside noise. 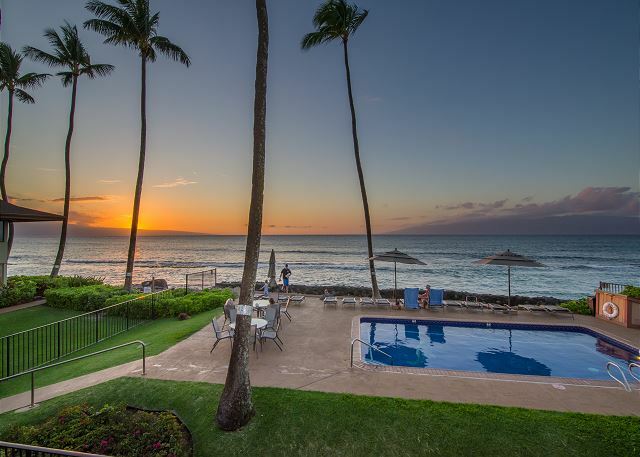 You just can't beat the location, availability, features, cost and general amenities of Hale Kai. We stayed in 216, well appointed, clean and perfectly functional. Valarie is a blessing, and the process for booking and checking in, even late on a weekend, is flawless. 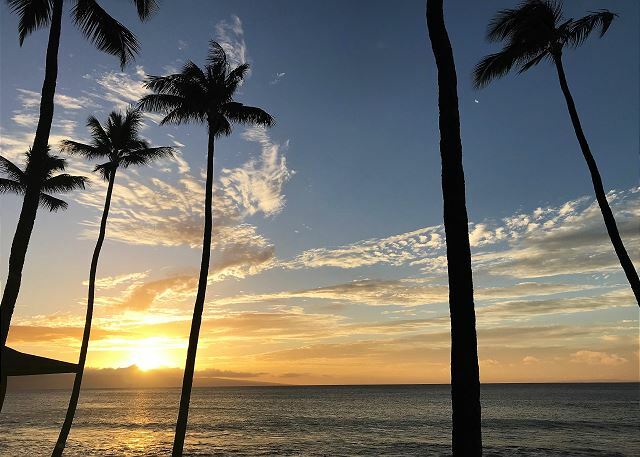 Don't have a single bad thing to say about our Hale Kai experience; if you are looking for a place to relax between your other hawaiian adventures, where you can do things at your own pace...Hale Kai is the place. Very elegant modern and relaxing atmosphere has been created in this great condo. We had a wonderful time soaking in the peace overlooking the ocean from our lounge and balcony. I so enjoyed my stay at the Hale Kai #216. It was a comfortable space, nicely decorated and very clean and well kept. The view was spectacular and quiet. The pool area was nice as was having a small beach only steps away. I would definitely recommend this rental. The rental unit was exactly as described. The experience was the best we could have hoped for. Would definitely visit again. As an indication of our satisfaction, we looked at an open-house for another unit while visiting.